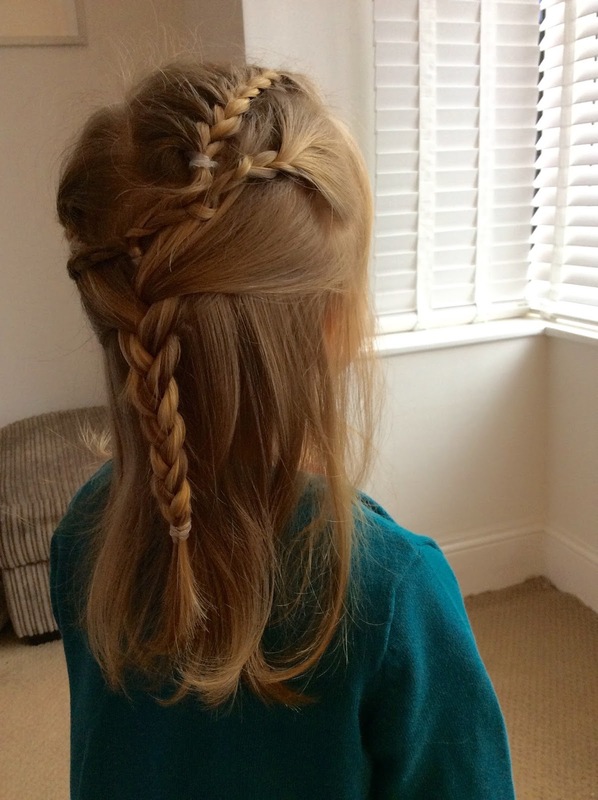 This is my first post showcasing our week in pictures. Although in last Sunday's Sunday Reflections I did post 6 or so photos I didn't elaborate any more on them. So inspired by Claire who blogs over at The Witt Family and her recent Week in My Pictures, I decided to create my own. I hope you enjoy. 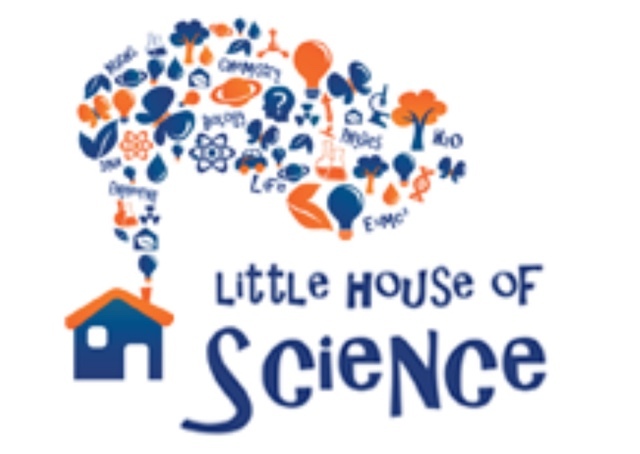 As well as creating a blog post for The Little House of Science, Monday felt like one of those busy days. Lily went to preschool in the afternoon and after a dog walk with Digby, Alexander and I walked to town with the idea of getting a new lead since somehow Digby had twisted his lead around a rear tyre of the pushchair! Luckily it was a dry day, but it got dark a lot earlier and I had to race home to roast a chicken. Our oven can be a bit temperamental with its thermometer, so it wasn't quite done by the time Rob and Lily came home. It was delicious when it was finally cooked. Rob and I celebrated our third wedding anniversary. We exchanged cards and small gifts. The theme for three years of wedded bliss is leather. I received a very nice pair of dark tan leather gloves, which kept my hands every warm, dry and cosy during our misty wet dog walk later in the forest. 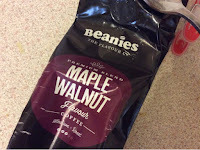 I enjoyed possibly my penultimate Beanies maple and walnut coffee. The bag is almost empty and I have enjoyed it thoroughly. It feels like a treat and unlike some flavoured ground coffees, this actually has a rich nutty yet sweet flavour. 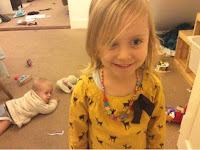 The kids had a whale of a time ransacking the living room, hours after they had helped tidy up. Typical! Alexander found a pair of my knickers and wore them around his neck, he's a strange one and decided to have a tantrum. If he could talk, he would probably say that I was being an #assholeparent for some irrational reason. Maybe I didn't let him walk around brandishing an un-lidded glue stick, he has taken a liking to it which is strange. On Thursday, Alexander and I took Digby for a damp walk. It was misty wet but we persevered. By the end of the walk whilst we were on the home straight it started raining sideways. At that point I decided to take the bus into the centre of town, rather than walk in as usual. We met Claire and Violet for a spot of retail therapy. The kids were very good; Alexander adores Violet. We accidentally took the lift up to the food court as we were talking too much so we decided to have brunch/lunch at the Handmade Burger Company. 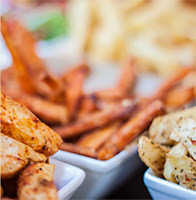 We figured that if customers were queuing for KFC at 11:10am then we wouldn't look too out of place ordering sweet potato fries and a cheeseburger! Today was a horrible wet day and we suffered a bit from cabin fever. We focussed on phonics and Lily writing in different sizes. 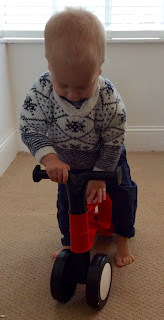 The kids received a Toddlebike2 to review and were very excitable. Alexander had a sit down on it, then proceeded to wave it around! He isn't the strongest baby in the world, the pre-balance bike is just super light! Another wet, miserable day, so like many families we headed for the swimming pool. Lily is very confident in the water and enjoys rolls around like a mermaid. She has requested goggles so she can go underwater! Alexander actually enjoyed this visit. I think initially he just dislikes the cold and the massive bubble jets around the rapids. We had dinner with our long-time friend who we met whilst at university but lives locally. I left Rob at home with the kids in bed and skedaddled off to watch The Martian and saw a few fireworks on the way. It was a long film and there was one thing that stuck in my mind; I noticed Mark Watney had Variera IKEA storage boxes on Mars! Today saw us up early which we weren't ready for, having only gone to bed at midnight we felt like we could have a few more hours! I baked some spelt pastry jam tarts to bring to Violet's birthday party and I'm quite surprised that Rob didn't eat any for breakfast! We had a wonderful afternoon; the kids had so much fun and I swear Alexander weighed more when we left. I couldn't believe how much he ate - where does it go!? Thanks for reading, hope you have a good week ahead.